I can mostly only connect to the internet using metered connections, and use Glasswire to monitor how much data each of my applications eats. I also have Office updates disabled to prevent excessive data usage. I've noticed that every time I have Word 2016 open, it uses surprisingly high amounts of data for no obvious reason - not vast amounts, but more than I can see any explanation for. 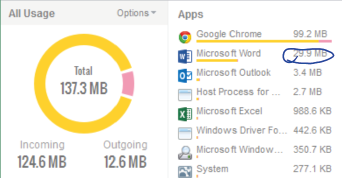 Word itself gives no indication or warning of why it's eating all this data, and Office 2016 is an application that is aware that my network is a "metered" connection. It can't be anything to do with checking Office 365 accounts (I'm on a Business subscription, in case that's relevant), because if it was I'd expect Excel to do the same, but Excel only eats kilobytes of data. Why would Word be eating tens of megabytes of data every few hours when not doing anything (just sitting with one document open in the background) and not updating itself (because updates are off)? Currently, because it seems excessive and there's no reason I can see, I'm using the firewall to block it. Browse other questions tagged microsoft-word bandwidth microsoft-office-2016 or ask your own question. Where does word 2016 store the data for “Numeral” option? In Word 2016, what is the difference between blue and black paragraph markers?